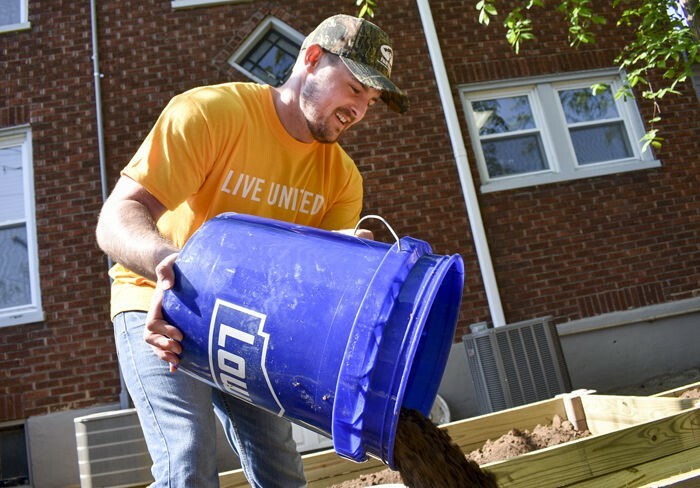 Nine F&M Bank employees added soil and planted a vegetable garden behind Mercy House, a nonprofit that shelters homeless families while helping them save for and find affordable housing, on North High Street. along with eight others from F&M Bank for United Way’s Day of Caring. Wednesday was a record-breaking day for the United Way of Harrisonburg and Rockingham County as 629 volunteers came out for the nonprofit’s annual Day of Caring. Nearly 50 teams tackled 53 projects at 26 sites across the city and county with 175 more volunteers than last year, said Executive Director Laura Toni-Holsinger. The event, which began in 1992, matches volunteers with various projects in the area, helping nonprofits, organizations and homeowners with yard work, maintenance and administrative work, among other things. 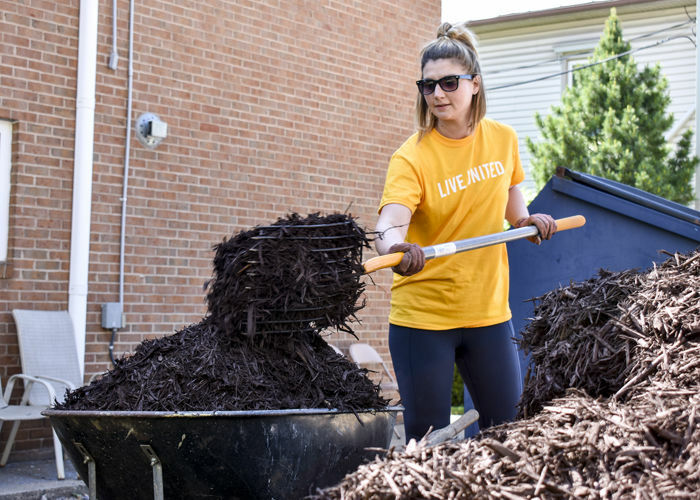 This year, the United Way sought a variety of projects for people of all ages and with different skills, Toni-Holsinger said, which likely helped attract more volunteers. 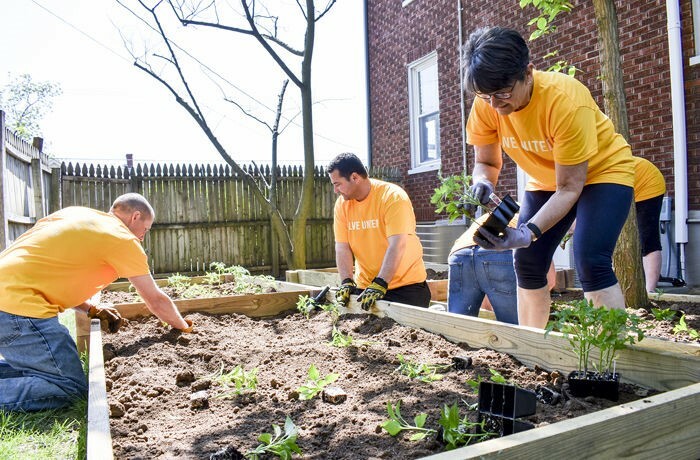 Nine F&M Bank employees added soil and planted a vegetable garden behind Mercy House, a nonprofit that shelters homeless families while helping them save for and find affordable housing, on North High Street. Clients will eat the vegetables in the summer, said Shannon Porter, executive director of the nonprofit. The crew also spread mulch around Mercy House’s playground. The free labor “is huge,” Porter said, as the shelter’s staff don’t need to take time away from running the operation. Mercy House also doesn’t have the money to hire someone to complete the projects, he said. Josh Hale, 41, of Harrisonburg, who has volunteered for the Day of Caring the last six or seven years, said he showed up at Mercy House on Wednesday to give back to the community and support people in need. Kelsey Wakeman, 25, of Elkton, who also volunteered with the F&M Bank team, said they chose to work with Mercy House to support its mission. Toni-Holsinger said the day also connects people with nonprofits, perhaps introducing them to more volunteer opportunities. Karla May of Rockingham County help plant the garden bed.